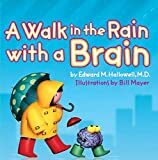 Review of "A Walk in the Rain With a Brain"
A Walk in the Rain with a Brain might be thought of as a young child's picture book equivalent of Mel Levine's A Mind at a Time and The Myth of Laziness. Both share the message that judging children in terms of their success on standard tests is harmful and each child has his or her own strengths that should be cherished and nurtured. As Fred the brain says, "Everyone's smart! You just need to find out at what!" It is a positive message and it might help some young children. It is especially aimed at children diagnosed with learning disorders and behavioral problems that disrupt their ability to study, such as attention deficit hyperactivity disorder. At the end of the book, there is a guide for parents and teachers on how to discuss these issues with children. Unfortunately, the computer-generated graphics are somewhat crude and may leave children unimpressed. More problematic is the story, which tells what happens when a brain named Complain created the word "smart" so that he would seem better than all the other brains. It gives a constructionist understanding of testing as no more than an attempt to privilege some people over others, without demarcating any really important abilities. If the book succeeds in reducing anxiety over tests, it might be helpful. However, if it stops children from caring about those tests it may ultimately do more harm than good, because whether or not we like it, tests are very often used to determine children's abilities, and doing well at them can open opportunities to children that other children do not get. So parents and teachers should look through this book carefully before deciding whether it is likely to be helpful.